Every goddamn day: 04/22/19: "A black day it will be for somebody"
"Black Friday" is an odd term. The day after Thanksgiving, of course, when shoppers descend upon stores to snag discounted items and, increasingly, buy stuff on sale on-line. A carnival of cut-rate consumerism then. And bargains are a good thing. So why the "black"? Historically, a black day was something bad. "A black day it will be for somebody," Richard III says, waking from bad dreams to find gloom over Bosworth Field. Sept. 24, 1869 was called Black Friday after Jay Gould and James Fisk's attempt to corner the gold market. After hoarding gold for months, the two started dumped their gold supplies, made their profits and crashed the economy. The price of gold dropped 15 percent in minutes, the stock market crashed 20 percent in the next week, and panic ensued. In general "black" get attached to financial collapses, massacres, deadly storms—so how did it get attached to what is traditionally the busiest shopping day of the year, the kick-off to the Christmas buying season? The generally-accepted explanation is the term was applied to post-Thanksgiving shopping in the 1950s by the Philadelphia police, who used the term to describe the angry mobs and traffic snarls created by department store sales. This situation was worse in the City of Brotherly Love, supposedly, because it also hosted the Army-Navy Football game on Thanksgiving, which in the pre-Super Bowl era was a huge event and also stretched cops thin trying to maintain order. The newspapers borrowed it from the police,, with the Philadelphia Evening Bulletin putting it in a headline in 1961. "We used it year after year," wrote Joseph P. Barrett, a police reporter for the Bulletin at the time. "Then television picked it up." I have no direct personal experience with Black Friday shopping. I like a sale as much as anybody, but can't see facing the crowds. My younger son needed a new coat, and we slid by Macy's Wednesday. The store was empty. "Department stores are going away next," I said to him, as we made our selection and headed to the clerk, who assured us that it had been crowded that morning. The coat was 60 percent off, savings enough for my needs. Usually the shopping struggles, the mobs crushing against doors, the tug-of-wars over cheap goods, is portrayed as some kind of indictment of the materialism of our society. The public, safe at home with their purchases, watches the news and tut-tuts. 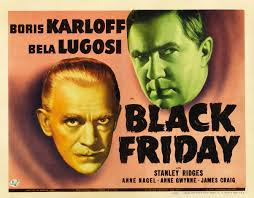 But with the plutocrats in control in Washington, running riot, unchecked, the way Jay Gould and James Fisk did in the Grant administration, my gut tells me that this year any Black Friday disturbances will be seen more sympathetically. Or should be viewed that way at least. With the neck of the middle class stretched, turkey-like, across a tree stump, and the Republican Congress whetting the axe, saving money and stocking up on hard goods suddenly seems blameless, even prudent. It's going to be a long winter. I always understood the meaning of Black Friday to suggest that businesses would get out of the red and into the black on this shopping day and that Christmas season sales amounted to most of their profits for the year? I had my eyes opened as to "60% off" when I worked at a stage lighting store. The prices of various lamps (what we would call a "light bulb," however exotic) were very high, particularly as compared to the price of ordinary bulbs dispensed at zero cost by Commonwealth Edison. However, a lamp costing $100 might be discounted for a school to $50 with an additional 50% discount if the school was a charity plus steady customers might get another 50% off. So, a specialty lamp listed at $100 would actually cost $25. And the store still made a profit. How about the current business view; When your in the "black" you are making money. If you are in the "red" you are not making money or have debt. Retail look to Black Friday to enhance their bottom line. Funny, I always had the impression the name arose because for some retailers that would (hopefully) be the day that brought their accounts into the black. Live and learn! I, too, thought Black Friday referenced accounting. I did go out shopping today, only I left around noon and got pretty much all I went out for. No crazy crowds, less chaos. I used to do the early doorbuster times until the year I saw a lady being knocked out of a wheelchair and elderly people getting shoved aside for some silly kitchen appliance. That was it for me.